For four days the main piazza in this Chianti village will be transformed into a wine event starring local vineyards large and small. Showcasing their vintages winemakers Fattoria La Quercia, Panzanello, Il Molino di Grace, Villa Cafaggio, Fontodi, Ruggero and Il Palagio will join at least 12 other estates to present their Sangiovese, Chianti Classico and Riserva as well as IGT, or specific locality, wines. The informal setting provides an opportunity for folks to taste the fruit of the vine, chat with winemakers and learn more about winemaking techniques. 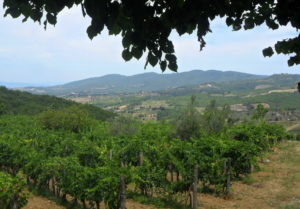 The area, known for organically grown grapes, developed the project “Sustainable Panzano” with the objective of becoming the first Italian organic wine zone. At this time more than 70% of all vineyards in Panzano have managed to eliminate synthetic chemicals in their viniculture and become sustainable. This year’s entry fee for unlimited tastings is €20. The Panzano Winemakers Union announced plans to donate part of the fee to the local primary school as well as a portion for construction of a women’s cooperative in Brazil. Visitors attending the event can expect the added pleasure of live jazz music from local musicians on Saturday and Sunday from 6 to 8 pm.